Mangaluru, May 29, 2017 : Madhusudan Kumar gave a scintillating Sitar recital at ‘Kudla Kala Mela’, held at Kadri Hill, Mangaluru on 15, April 2017. He was ably accompanied on the Tabla by NageshPai(Disciple of Pt.Taranath who was at ‘Kinnara’ - music school of Sitar maestro Pt. Ravi Shankar). During his school and college days at St. Aloysius College, he learnt to play Tabla and later Sitar under the tutelage of GulvadyRatnakarBhat(Disciple of Pt. ShridharPalsikar). At Bombay, he continued to learn under Prof .DattatreyaS. Damle(Disciple of Pt. Vishnu DigambarPaluskar) and Radio artiste Pt. Giriraj. He became the disciple of ‘Bharat Sitar Samrat’ Ustad Vilayat Khan Saheb and resided at Shimla, Dehradun and later at Kolkata; whenever Ustadji arrived from overseas. As an accomplished portrait artist, he painted the oil portraits of the ancestors of the maestro. The ‘Gharana’ was named after Ustad Imdad Khan Saheb, his grandfather and a legendary Surbahar and Sitar performer of his time; termed as a genius. His equally famous father, Ustad Inayat Khan Saheb also contributed immensely to the evolution of the Sitar and music in general, as a multi-facetted personality. His wife Begum Bashiran belonged to the renowned singing ‘gharana’ of Etawah in Uttar Pradesh. Her father,Bande Husain Khan and brother Zinde Husain Khan were the torch bearers of the vocal style of the region. Vilayat Khan Saheb propounded the ‘Singing Sitar’ by creating the idiom of ‘Gayakiang’ - the ‘Vilayatkhanibaaj’ with a touch of minimalism, by freeing the Sitar from the baritone ‘Beenkaariang’. In order to achieve the five notes ‘meend’(glide), he made several changes in the instrument by discarding the ‘mandra’ss(lower) wires, in tandem with its ace makers like Kanailal brothers, Hiren Roy and his brother Santosh Roy and others. Earlier, Inayat Khan Saheb and Gurudev Rabindranath Tagore too contributed to its evolution (as narrated by Vilayat Khan Saheb). ‘DaaraDaaraDaadaara’- the language of the Sitar with the applications of ‘meend’, ‘zamzama’ (decoration) -balanced and deft usage of the right and left hands are the hallmarks of the‘VilayatKhaniBaaj’. Hazrat Amir Khosrau(11th CenturyKhilji dynasty at Delhi) adapted many Carnatic ‘Raagas’ to the ‘Hindustani Classical’ tradition. 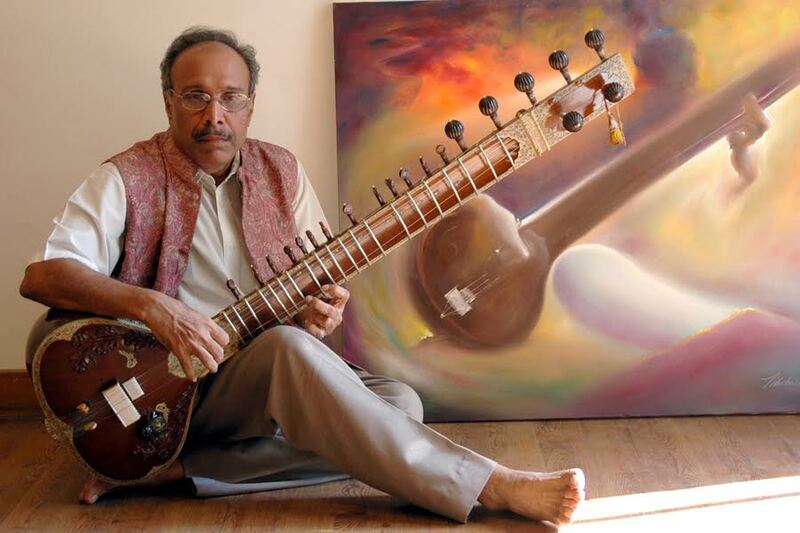 He was the inventor of the three strings Sitar known as ‘Sehtaara’ in Persian. During the six centuries since the Moghul era, Sitar underwent metamorphosis to evolve into the current form and shape.